You get an adapter and you get an adapter and you get an adapter! NZXT is the newest in a growing line of cooling makers to offer a bracket upgrade allowing its existing coolers to work with AMD's new AM4 socket. Anyone planning a build around Ryzen can request the free retention bracket. The offer applies to all current Kraken users. More specifically, it applies to Kraken X31, X41, X51, X42, X52, and X62 all-in-one liquid coolers. "We at NZXT believe in providing high-quality components to our customers as well as exceptional customer service no matter where you live. We are currently producing a retention bracket to support the new AM4 socket as well as the AM2 and AM3 sockets and will be providing this for free to all qualified users. This retention bracket will be ready to ship starting March 15, 2017 to our customers worldwide," NZXT said in a statement. Visit NZXT customer support and submit a ticket. Choose "AM4 Bracket Support" as your department. Attach your Kraken series AIO liquid cooler proof of purchase. Attach your motherboard with AM4 socket proof of purchase. Once NZXT validates your information, it will process your information and ship out the bracket free of charge, starting March 15. There does not appear to be any shipping charges, not unless you live in the U.S. and want to upgrade to Priority or Overnight shipping. Those options cost $15 and $25, respectively. Going forward, NZXT says it will be updating its Kraken products to include the new bracket inside the box starting mid-March. It expects retailers to have the newer packages by the middle or end of May. NZXT is not the only one doing this. 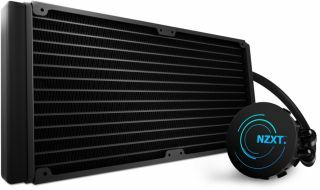 Reddit is maintaining a running list of companies providing free AM4 brackets that include Alphacool, BeQuiet, Cooler Master, Corsair, Cryorig, DeepCool, Enermax, Noctua, Phanteks, SilentiumPC, and Thermalright.